Wheel Repair: Reducing the damage to your wallet. Bang! and it happens. You hit the granddaddy of all potholes. If you’re lucky, you’ll ride on and not find out about the damage until later. Worst case: You’ve done enough damage that your tire quickly loses its air pressure. There are many other ways to accomplish essentially the same, sad destruction. Our roads are littered with hard objects or we foolishly fail to see that curb. Wump. It doesn’t take long. The result is a bent wheel. Today’s aluminum alloy wheels can tolerate a fair amount of abuse. But push past a certain limit and the result is an unattractive and often dangerous ding. 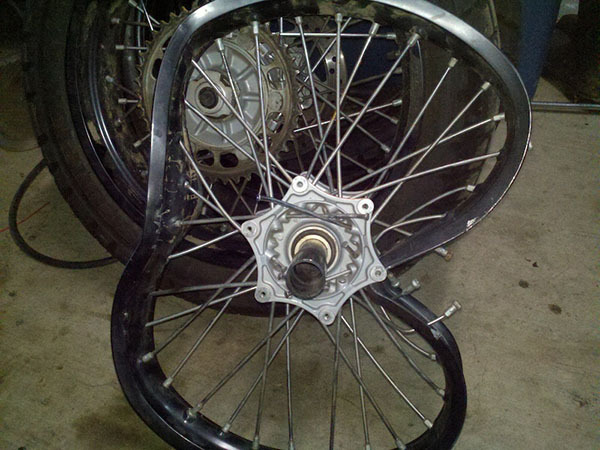 Often, the net result is wheel replacement. 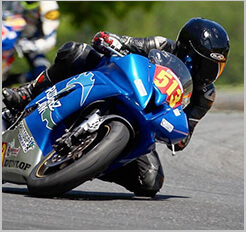 With motorcycle wheels costing several hundreds of dollars (or more) apiece, this can be one major financial setback. Depending upon the extent of the damage, however, there might just be a more affordable and effective solution. Aluminum alloys are malleable metals. They are used because they can easily be shaped into strong and attractive designs. Not only can they be shaped, they can also be re-shaped. What is bent can be bent back. Basically, the wheel repair is done by putting the wheel in a jig and using a hydraulic press to push the metal back into place. The machine itself is similar to one that would be used for frame straightening, a somewhat related black art. A torch is used to heat the metal to allow it to bend more easily without breaking. Simple dents don’t take too long. This is basically hand labor that requires time, experience and a perfectionist attitude. There is a lot of variety in wheels and different brands vary in repair-ability. Some alloys are softer than others, although soft wheels aren’t necessarily easier to repair. Sometimes the surface can just push in without the dent pushing out. It then takes more time and effort to get the dent out. A soft wheel can become wavy if you’re not careful, not a good situation for strength or aesthetics. A good repair person won’t fix any damage. If a wheel is badly cracked, the metal has been compromised. If the damage is over too large of any area then it’s is rarely repairable. Small cracks and notches can sometimes be fixed by welding, but it requires someone both expertise and experience to make the call. There is always a question of safety with any wheel repair. While it’s even possible a repair can be made stronger than the original wheel, there is also a chance of smacking a wheel exactly where it was repaired and causing catastrophic failure. Just be sure you go over the issues with the person doing the work. With a good repair costing around one or two hundred dollars, that can be a major savings over a thousand dollar replacement.